“Eat great food, help great people” is the motto of Kyle’s Kitchen, a 2016 Santa Barbara Independent Foodie Award winner. 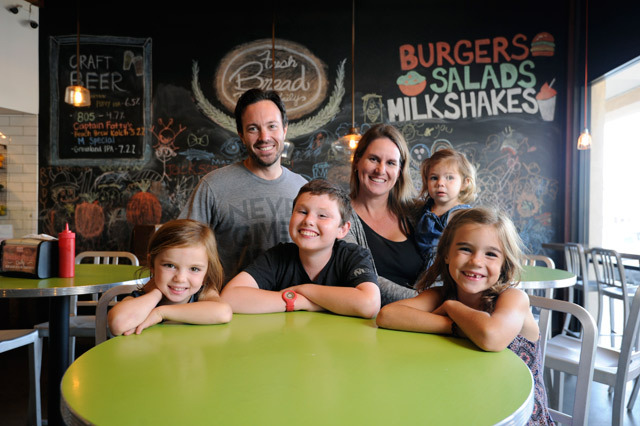 This Saturday, May 27, 11 a.m.-2 p.m., the award-winning burger joint will celebrate the grand opening of its second location, at 791 Chapala Street in downtown S.B. With Mayor Helene Schneider heading the event’s ribbon-cutting ceremony, Kyle’s will offer savory burgers, refreshing salads, and philanthropic ways, forming a trio that has clearly made a mark throughout the local community. In 2015, the family-run business launched its first location in Goleta under the ownership of Deena and Jay Ferro. Their 13-year-old son, Kyle, who was born with special needs after suffering from a brain injury, inspired the restaurant to double as a space that spreads awareness of and encourages connections to individuals with mental disabilities. In fact, Kyle’s operates with one mission in mind: to give back to the local special-needs community. With every meal purchase, customers do more than just their bodies good. This is because each month, Kyle’s Kitchen contributes a portion of its proceeds to a local special-needs organization within Santa Barbara. The restaurant donated more than $100,000 since emerging almost two years ago. It fundraised for more than 20 groups including the Special Olympics, Alpha Resource Center, and Devereux Foundation. This month, Kyle’s Kitchen is partnering with SlingShot Alpha Art Forum, a working art studio and gallery created by adults with special needs. The gallery is an expansion of Alpha Resource Center, which fosters a community that embraces the contributions of people from all walks of life. SlingShot exhibits the work of more than 34 artists with developmental disabilities who, in addition to creating gallery pieces, compete in juried art shows. Better yet, the working studio environment allows visitors to not only meet the artists but also watch their artistic talents unfold before their eyes. Artists work with a variety of media including ceramics, fabric arts, woodcarvings, and everything in between. At the studio, artists are free to explore their imaginations, unhindered by the challenges of the everyday. For some, what begins as an intangible idea beautifully culminates into the paintings Kyle’s Kitchen displays on its tangerine-colored walls. Helping special-needs individuals reach their full potential is truly where this family-friendly restaurant shines — now you can be a part of that.